MMMMMMMMMMMMMMMMMMMMMM. Our Christmas Eve dinner 2 alarm chili (made with steak), and cornbread…our bit of Texas home. Thanks for visiting my blog. We love us some cornbread here in the south don’t we? It goes with just about anything. My Mama always fixes it with pintos and onions. Her and Daddy even put it in a glass with milk. There are so many recipes for it, but I’ve never met any cornbread that I didn’t like. Thanks for sharing! My son would freak for that cornbread, he loves it like he loves air! Thank you for coming to visit my blog. 🙂 It was nice to have you! Mmmm, that looks so appetizing…I love cornbread and could eat some right now! 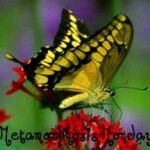 Now that is my kind of Metamorphosis. Looks delish. Way to think outside the pan! 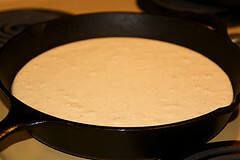 You can’t make good cornbread without using a cast iron skillet. I’ve had mine for over 35 years. BTW, I notice that this is from a town on the White River. My husband grew up on the White River in Newport, Arkansas. 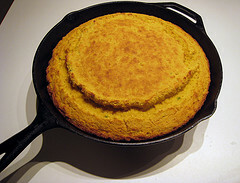 mmmmm nothing like cornbread fixed in an iron skillet! the cast iron pan too ! What a wonderful post. Cornbread is an important food memory in my familly as well. In fact yesterday I baked my father a pan of cornbread to take to him. That looks sooooooooooo GOOD… a little honey butter and I would be in heaven!